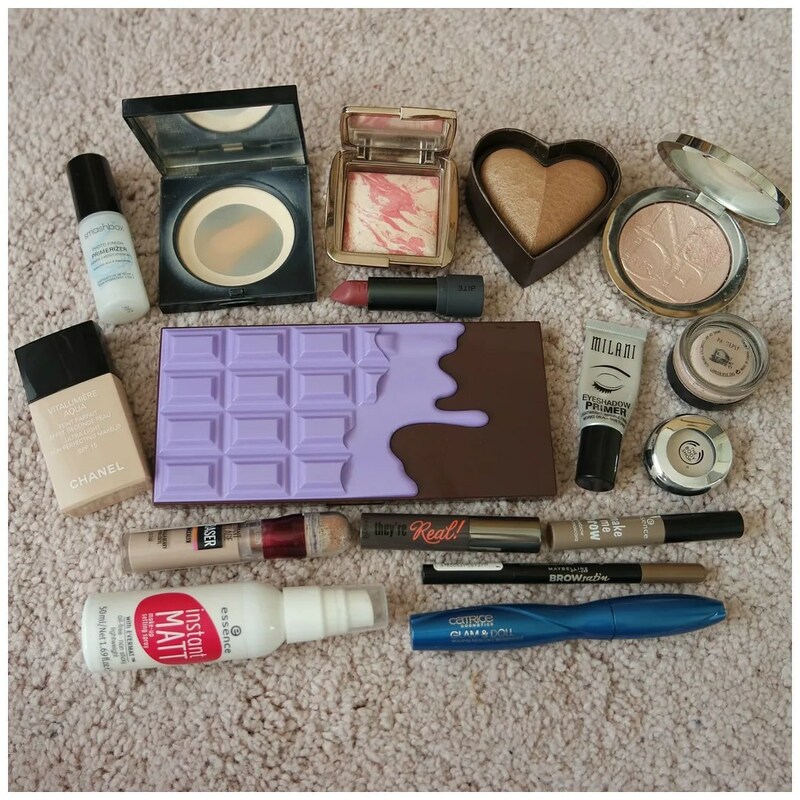 A new month means I give you an overview of the makeup I wore the month before. It was summer, so I went in with a lightweight base, tried some more new products, but also picked out some of my favorites as well as some products that I felt needed some more love. Here are the products I shopped my stash for in August 2018! Smashbox The Primerizer – I’m trying out a new primer! I started using this over this past month. I just got a travel size to see if I like it. So far so good. A full review will be coming your way soon! Bobbi Brown Pressed Powder – This powder I’ve decided to phase out of my life. I am so over it. Not because it is not a good powder, but because I’ve been using it for months and it just feels like it will never run out and I would like to try out some other ones. And you can see that this is pretty much gone. I am having a hard time getting much more product out of it, so I’m calling it quits on this one. Hourglass Ambient Lighting Blush Diffused Heat – One of my favorite blush formulas. Expensive, but really really good. This blush gives the most beautiful flush to your cheeks. It is also quite a unique shade in my blush collection and perfect for the summer time. Too Faced Sweet Tea bronzer – One of my favorite bronzers for the summer time. Of course it had to make an appearance! Dior Nudeskin highlighter – Dior highlighters are so pretty and soooo expensive. So I wasn’t really using mine. So I made a point to bust this out and I wore it all month. Chanel Vitalumiere Aqua foundation – After using up my Urban Decay concealer I was looking for another lightweight base product to use. And I went with this and I think I am very close to using this up, so I think I will just try to soldier on with this until it is gone. Bite Beauty lipstick Pepper – Right on the cusp of Sephora US discontinuing service to Europa, I placed an order and got myself some new Bite lipsticks. This shade being one of them. I have been wearing it loads. I haven’t gotten round to reviewing it yet, but I did review some of the Bite lipsticks I already owned. I Heart Revolution Violet eyeshadow palette – The purple palettes are here and I looked at this online and knew I’d love this. I’ve been playing around with it for a bit and hope to review it for you soon. However, I’ve been doing so many eyeshadow palette reviews, I think we need a bit of a break. Milani eyeshadow primer – My current go to eyeshadow primer. This has featured in many of these posts. MAC paintpot Painterly & TBS eyeshadow no. 13 – And another favorite, but this time in tandem. I hit pan on my paintpot last month and I feel that I am now really making good progress on this. I am curious to see how long this will continue to last. Essence Make Me Brow browgel – Brow gel is essential to me and this is my favorite. This is a repurchase, I used up one before and I keep going on and on about this. Maybelline Brow Satin brow pencil – Currently working on using up this pencil. This is a repurchase, but I find it is no longer my favorite. The shade is a touch too warm for my preference. Maybelline Age Rewind concealer – I finally found a shade match in this. I tried it years ago and didn’t like it. I now know that that was because the shade Light was too yellow and too dark for my skin tone. I am now using fair and that is serving me well. Full review coming soon! Essence Instant Matt setting spray – A good contender if you are looking for an affordable setting spray. It doesn’t quite match the Urban Decay All Nighter, but it certainly gets the job done. Benefit They’re Real & Catrice Glam & Doll mascara – New month, new mascara. I am still using up some trial sizes that I had lying about. They’re Real has been great so far. I am liking it and I still top it off with the waterproof Catrice mascara to make sure it lasts all day. Thanks! I am really liking the Maybelline concealer. I have never tried the Benefit product, but I have heard they are quite comparable. Good to know! I’ll try the essence one to see! in love with those products.